A Virginia judge ordered her taken into custody until the grand jury's work is finished or she decides to testify. Manning, 31, told US District Judge Claude Hilton that she would "accept whatever you bring upon me", but would not testify, the Associated Press reported. On Friday, Manning said in a statement: "I will not comply with this, or any other grand jury." "Imprisoning me for my refusal to answer questions only subjects me to additional punishment for my repeatedly-stated ethical objections to the grand jury system." 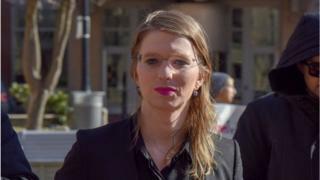 Chelsea Resists!, a group supporting Manning and seeking to raise money for her legal fees, said grand juries were "mired in secrecy, and have historically been used to silence and retaliate against political activists". "Chelsea gave voluminous testimony during her court martial. She has stood by the truth of her prior statements, and there is no legitimate purpose to having her rehash them before a hostile grand jury." Republicans criticised the Democratic president's decision at the time. Then-Speaker of the House of Representatives Paul Ryan said Mr Obama had set "a dangerous precedent that those who compromise our national security won't be held accountable", the New York Times reported. President Donald Trump has called Manning an "ungrateful traitor" who "should never have been released from prison".